Imagine Getting Things Done meets Livestrong.com meets…FarmVille? If you’ve been looking for a way to channel your addiction to web games toward overcoming procrastination, getting in shape, or nurturing your creativity, Mindbloom would like a word with you. Check out the review and screenshot tour inside. Three weeks from now, I will be a better person. Well, perhaps I won’t be any better off morally or idealistically, but I will (hopefully) be further on my way to achieving my financial, career, creative, and spiritual goals than I have been in years. And it’ll all be thanks to Mindbloom. What is Mindbloom? 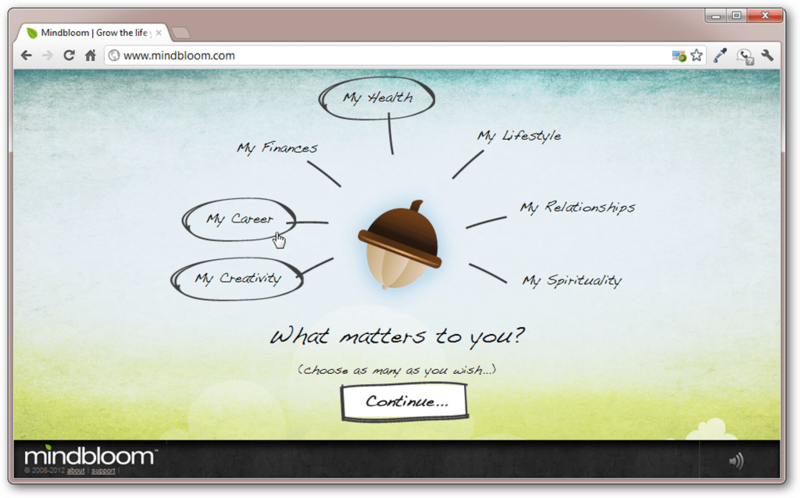 In a nutshell, it’s a new web-based game that helps you “decide what’s important, discover your motivation, and take meaningful action” towards improving your life. 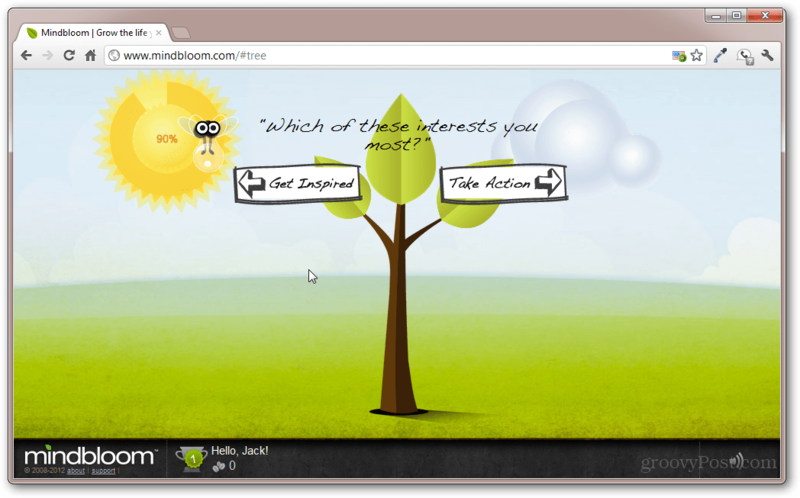 The crux of Mindbloom is the “gamification” of self-improvement. That is, it takes the familiar principles of self-examination, accountability, and goal setting and builds them into a game. The object of the game is to nurture your tree through sunlight (inspiration) and rain (action). In Mindbloom, the points may be symbolic, but the achievements are real life. Personally, I think Mindbloom may be on to something. Self help is far from a new fad. From Dale Carnegie and Stephen R. Covey to Oprah and David Allen, the past century has been rife with Yoda-like gurus guiding us to our full potential. But the way we follow their guidance continues to evolve in lockstep with the evolution of media. We’ve progressed (or regressed) from a culture that learns how to live through books to a culture that defines itself through television and multimedia. Now, we’re taking the next step from passive media to digital engagement. To whit, the explosion of casual, web-based games. Ten years ago, you’d never dream of having your great-aunt dial you up for a head-to-head Duke Nukem 3D match. But now, you probably get 33 Facebook wall posts a day from her about some Farmville chickens she’s trying to pawn off on you. In light of all that, the concept of Mindbloom is incredibly relevant. It brings meaning to the meaningless (yet somehow still gratifying) achievements, unlockables, and recognition that we receive from our ubiquitous online/social games. But having a sound concept is only half the battle. For Mindbloom to be a success, the experience has to be enjoyable. And to be usable on an everyday basis, it has to be lightweight, reliable, and obtrusive only in the ways the user invites it to be. So, how does it stack up so far? Read on. 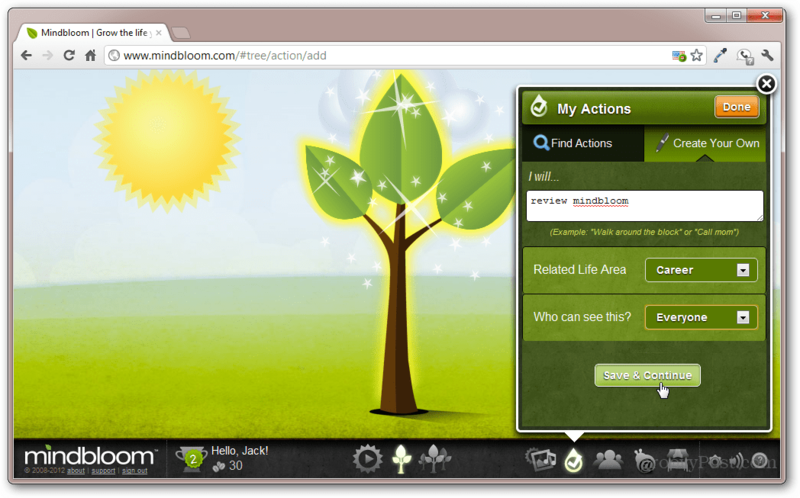 After having a been a Mindbloom user for about 48 hours, I’ll say that so far, I’m pleased. I did a fair amount of reading about Mindbloom before diving in, and I admit that I didn’t quite grasp what it was about at first. I understood the concept, as outlined above, but the actual “gameplay” of nurturing your metaphorical tree was still a bit abstract for me. Fortunately, it all made sense after about 120 seconds into the getting started tutorial, thanks much to the cheery shepherding of the “Enlightening Bug.” I went from having no clue to having my tree a-bloomin’ with three hopeful leaves (career, creativity, and health) in under 5 minutes. Choose the area(s) in your life that you’d like to improve. These become the leaves on your tree. Create actions that apply to each of these areas. Schedule these as you see fit. Get inspired by photos, quotes, songs, and users from the community. This boosts the sunlight gleaming on your tree. Complete actions to create rain drops for your leaves. Collect enough sunlight and rain drops to grow your tree. This helps you and your friends visualize your personal growth. I spent more time with the actions side of the process than the inspiration side. 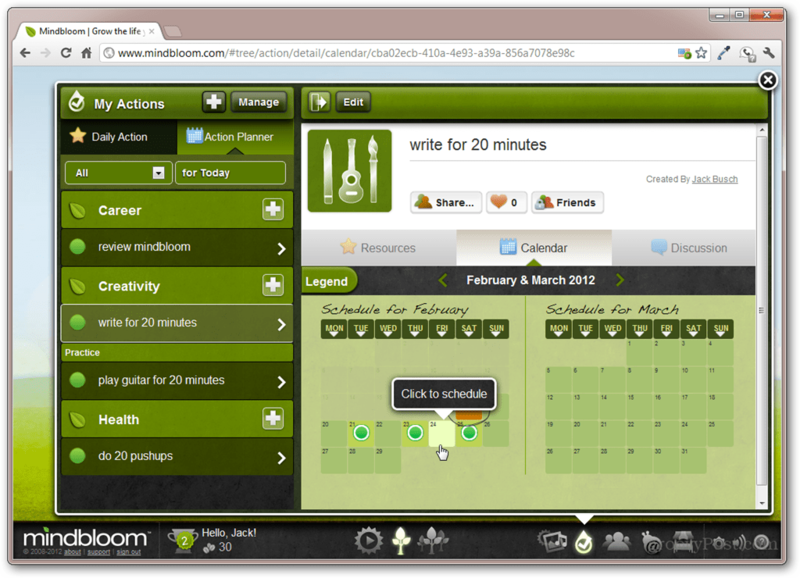 Actions in Mindbloom are a sort of glorified to-do list that get corralled under the relevant area of self-improvement. Mindbloom provides a few ideas to get you started—such as practicing guitar scales (creativity), adding a connection on LinkedIn (career), or going for a 30 minute jog (health)—but you can just easy easily add your own or borrow some ideas from the community. With a few clicks, you can set a few bite-sized goals for the week, the month, or even the whole year. The inspiration side of Mindbloom, while beautiful, is less engaging to me at this point. It comes pre-populated with imagery, quotes, and music designed to get you motivated. While the Mindbloom supplied inspiration is slick, it won’t be very long before you see repeats. 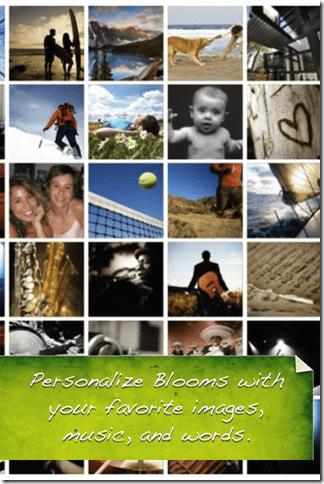 You do have the option to personalize the photos, quotes, and music however. 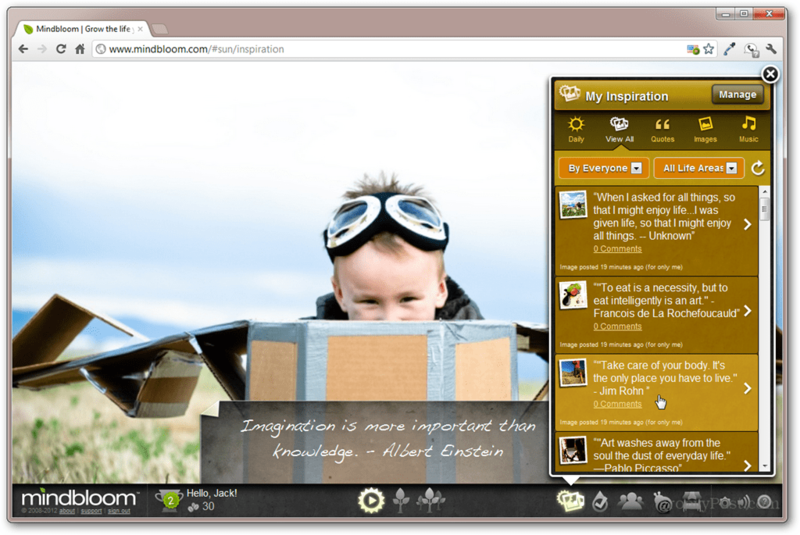 How rewarding the inspiration feature of Mindbloom will be for you depends partially on your own creativity (and how much high res multimedia you have on hand). For instance, it might be a good idea to have a pictures of your family, or your dream home to remind yourself why you are pouring so much time and energy into your career. Or, you could populate a health and fitness-related inspirational with pictures of the clothing you plan on buying when you get slim. But if nothing else, engaging with the inspiration side of Mindbloom juices up your sunlight meter, which is essentially for growing your tree. That’s apt for the metaphor—we all need to remain inspired and motivated in order to achieve our goals and fuel our actions. So, be sure to personalize your inspiration accordingly. 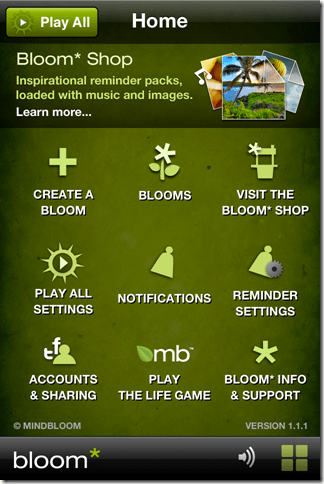 Mindbloom also makes a smartphone app called Bloom*. This serves more as a sidekick to The Life Game featured at Mindbloom.com. It focuses more heavily on the inspiration side of things, allowing you to carry photo slideshows in your pocket wherever you go. You’ll also get reminders to complete the actions you’ve assigned to yourself via your blooms. Bloom* also features some social connectivity, allowing you to share blooms and get spontaneous community challenges via Bloom* Mob. 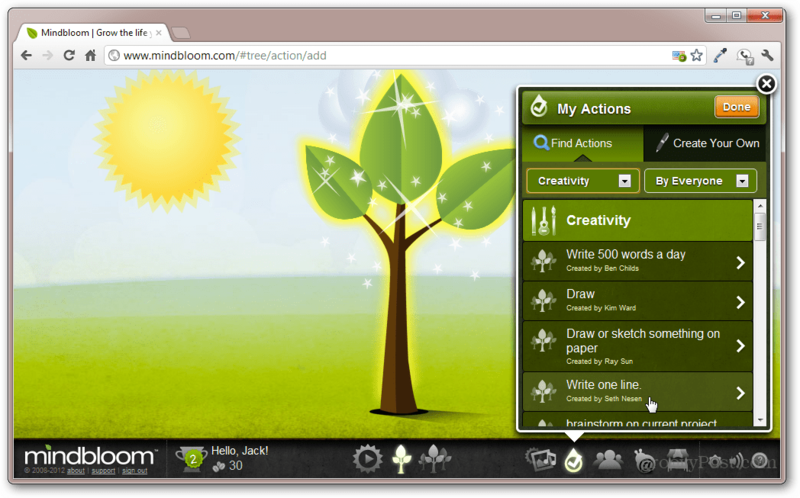 There are a few features in the full mindbloom.com website that are missing from the bloom* app. But it definitely shows potential. And it’s free! I will have to withhold my final judgment on Mindbloom for now. That’s because Mindbloom isn’t meant to be churned through in one sitting and then forgotten. It’s meant to be integrated into your lifestyle, subtly nudging your toward your goals in a way that makes accountability rewarding on an everyday basis. So, check back in a few weeks when I’ve had a chance to put Mindbloom to the test the way it’s meant to be. But I will say that, so far, I enjoy Mindbloom a lot. I’m already inspired just by the act of creating my tree and scheduling my actions. Personal to-do lists are a funny thing. Unlike our open items and long-term projects at work, which we conscientiously and systematically track with milestones and routine evaluations, our personal growth often takes a backseat to the other demands of life. 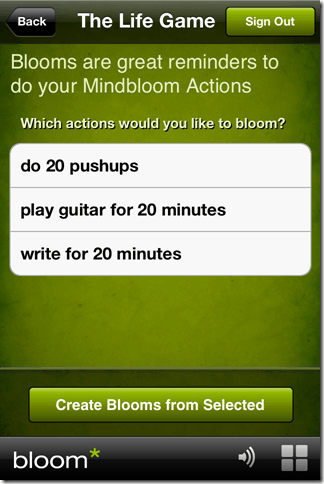 But with Mindbloom, those healthy habits come off the back-burner and get the daily attention they deserve. The simple act of picking a small action—i.e. doing 50 situps—and a day when the action has to be done goes a long way toward making your ultimate goals a reality. 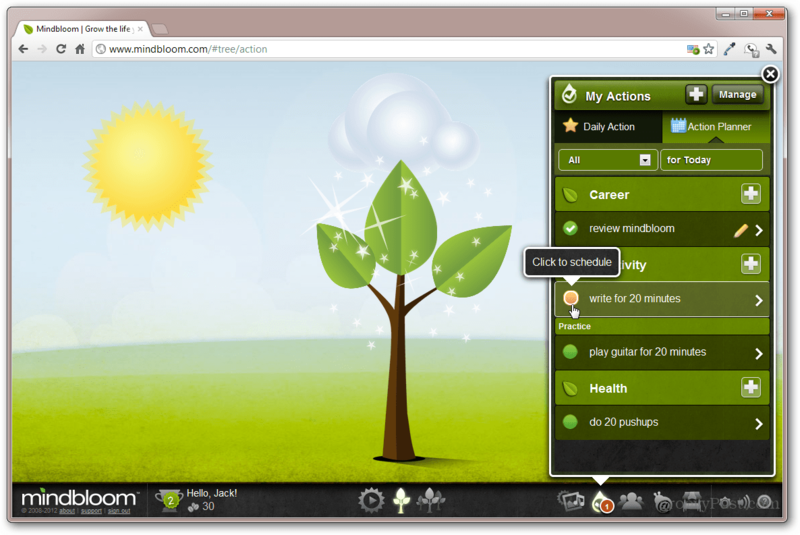 Mindbloom actually reminds me of the healthy lifestyle rewards programs that health insurance providers are offering lately. For example, my employer-sponsored plan offers me something like $150 in cash if I complete some basic steps toward a healthier lifestyle by the end of February. I imagine that many co-workers start the plan for the cash reward, but stick with the healthy habits because they become rewarding in themselves. There are some definite parallels that can be drawn with the Mindbloom model. In fact, the health insurance provider Aetna is one of Mindbloom’s biggest backers. Knowing that experts believe in a web startup is always heartening. 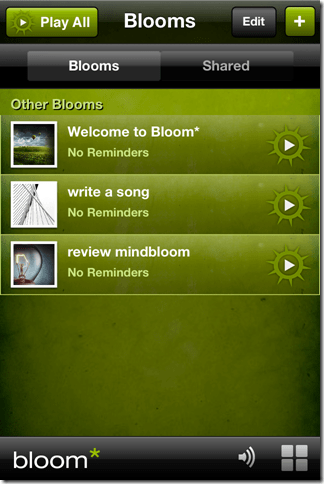 In addition, the launch of a new mobile inspiration app called Bloom has been a great success. The iPhone version was released in November 2011, and has organically generated over 250,000 downloads, and has over 15,000 daily users, converting at double-digit rates to the Life Game. See how Bloom works here:http://vimeo.com/31439840. You can download the app from the iTunes App Store Here. I also recommend reading this Huffington Post article written by Brent which delves into some of the science-y inspiration for Mindbloom. Overall, Mindbloom is worth a try. If you have five minutes and one or two areas in your life where you’d like to see improvement, Mindbloom could be just the ticket for you.